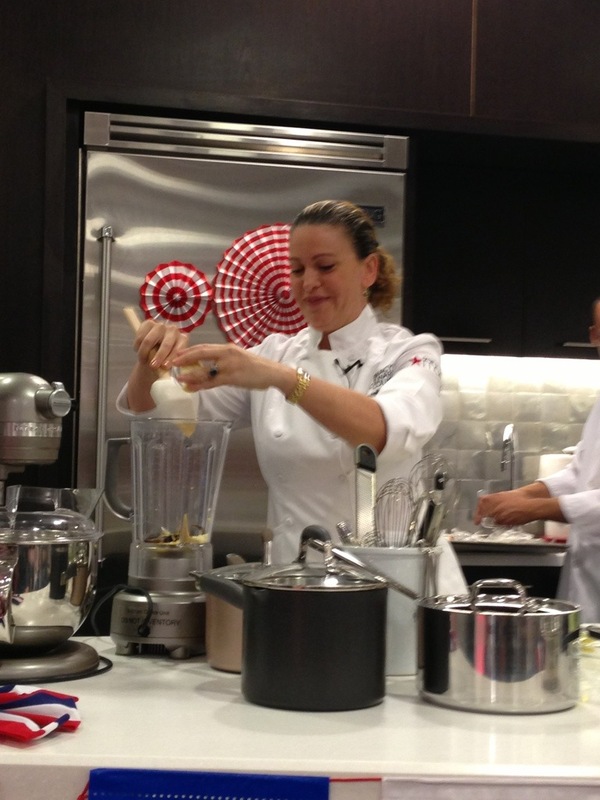 Last week I attended a cooking demo at the Macy’s Home Store in Aventura mall where I watched Chef Michelle Bernstein whip up some of her favorite dishes. It was a fun, relaxed event sponsored by Macy’s Culinary Council where about 100 guests were able to sip on a custom cocktail, try all of Chef Michy’s dishes, and engage in conversation with her! She is so down to earth and funny, funny, funny! 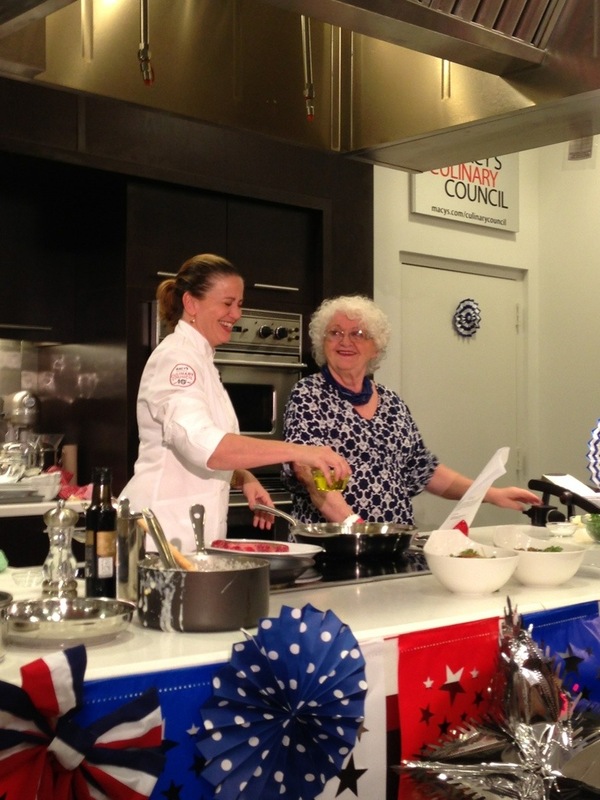 Her mother and father were in the audience and Chef Bernstein even brought her sweet mom up to help her with a dish! What a comedic duo those two are! Her mom brought her homemade meatloaf sandwiches (which Michelle said were her favorite) and after the demo was finished she started chomping down on one while chatting with guests! Love it! 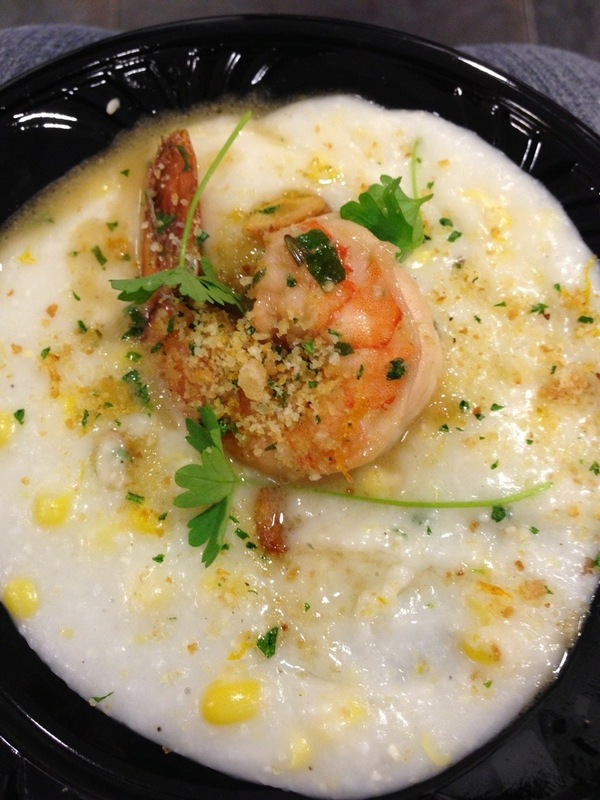 Michelle’s first dish was shrimp braised with Jerez wine, creamy grits with a ton of fontina cheese, gremolata, and crunchy sliced garlic. Man oh man, this was good. The cheesy grits paired beautifully with the crunchy gremolata and the shrimp (yes, one shrimp) was juicy and seasoned nicely. The garlic “chips” added a nice textural component and gave every other bite a swift kick of garlic to the tastebuds. 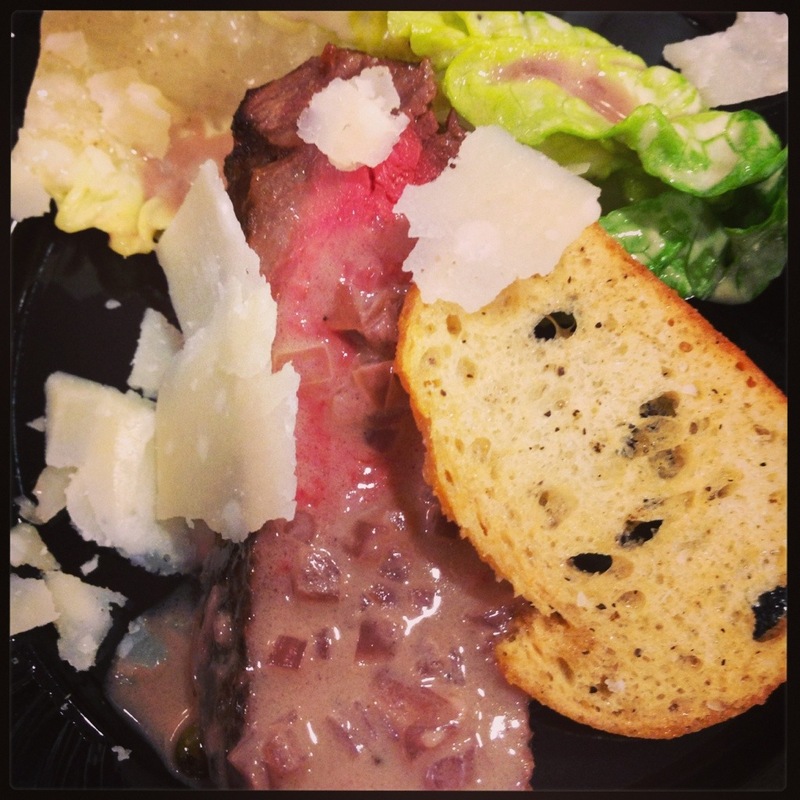 The next dish was a wagyu steak au poivre over a ceasar salad. Michelle likes to put the warm steak over the salad so that it wilts the leaves a bit. She made an interesting point in stating that by serving the steak and salad together one doesn’t miss the starch component and the diner would feel sated and I agree! I think I’ll try this next time I make steak. I’m not a big dessert fan (my boyfriend is scoffing now as he is reading this because I’m sure he’ll disagree with that statement) but we won’t get into that at the moment–let’s just continue and say that Michelle’s dessert was every positive food adjective you can think of! Amazing, delicious, sweet, scrumptious, divine, flavorful, well-rounded, and the list goes on and on and on. 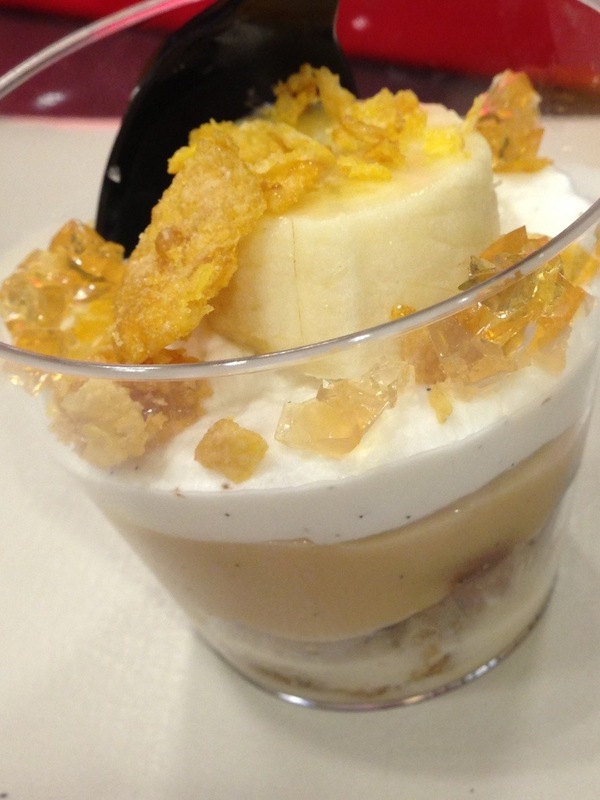 She made a banana tres leches (look it up here, my fellow gringos) with a candied corn flake topping, and bourbon jelly! Lord, have mercy! After Michelle finished cooking, she graciously answered questions, took photos with guests, and then signed copies of her cookbook, Cuisine a Latina. It was an entertaining night filled with lots of laughs and good food. Big thanks to Chef Michy and Macy’s Culinary Council! Fine with your permission allow me to grab your RSS feed to keep updated with drawing close post.